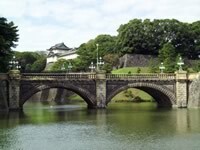 My co-worker asked me about sightseeing in Japan, so I noted about it here. She set the following conditions out. She will stay at her friend's house in Yokohama for 10 days. She will visit in November. She has never been to Japan so far. She prefer to day trips because she can back to Yokohama everynight. She can buy Japan Rail Pass if necessary. I've checked fares/fees as of October 2008, but they basically show the costs from Yokohama station. They may be changed depends on your nearest station, so please take them only as a guide. I've also estimated the cost (fares and lunch) for each place very ruoghly, but the cost does not include any shopping cost. I've got pictures from Wikimedia Commons (except ones in Tokyo Disney Resort). They are pubshed as public domain. Kamakura is a city located next to Yokohama. 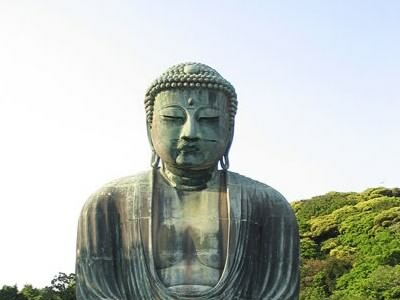 Kamakura is well known as one of ancient cities in Japan. Kamakura was used to be the capital of Japan around 1200 A.D. There are a lot of historical temples and shirines in Kamakura. I think this shrine is the biggest shrine in Kamakura. It's quite famous in Japan. Especially lots Japenese visit there on the first of January. This temple is renowned for Daibutsu (大仏), in other words, the Great Buddha (see the picture). This temple was founded by Hojo Masako (北条政子) who was the wife of Minamoto no Yoritomo (源頼朝) who was the founder and the first shogun of the Kamakura Shogunate of Japan. This temple is one of the great Buddhist temples. It has one of the largest wooden statue in Japan. You can take Enoden (江の電) to move around Kamakura and visit to Enoshima (江ノ島). One-day ticket is available (580 yen). 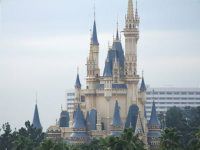 As you may know, Tokyo Disneyland is the most famous thema park in Japan. I've visited there in January 2008. Please see my report for details. You can check the schedule on the official website, but some information is available in Japanese page only (like the above time table). It will take about 1 hour from Yokohama to Tokyo Disney Resort by train. Some attractions are very popular, so you need to stand in very very long line. You may consider to use FASTPASS system to avoid long waiting. Asakusa is located on the north-east part of Tokyo. Asakusa is well known as one of traditional town areas in Tokyo. Senso-ji (浅草寺) is one of the most popular temples in Tokyo. Kaminarimon (see the picture) is a gate of Senso-ji. If you visit to Asakusa, I recommend you to visit to Kappabashi (合羽橋) as well. In Kappabashi, there are a lot of shops supplying the restaurant trade. You may marvel at especially plastic display foods (we call them "sample shokuzai"). To visit to Kappabashi, you can use subway [Tokyo Metro Ginza line (Asakusa - Tawaramachi) 160 yen (one way, about 2 mins)]. This area is well known internationally for youth style and fashion. Local landmarks include Yoyogi park (代々木公園) and Meiji shrine (明治神宮). 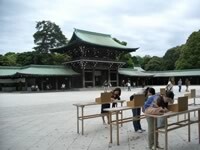 Meiji shrine is one of the biggest shrine in Japan. If you visit to Harajuku, I recommnd you to walk from Harajuku to Shibuya (see the guidance in Wikitravel for details). If you walk to Shibuya, the fare of returning to Yokohama will be 260 yen. Ginza is well known as a upmarket are of Tokyo. I recommend you to visit to Sony Building which is the showrooms of Sony. The first Apple Store in Japan is also located at Ginza. You can see Japanese traditional style drama at Kabuki Theater (歌舞伎座). It may cost around 800 yen depends on the length of drama. Tokyo imperial place, we call "Kokyo" in Japanese, is the place where Japanese imperial family lives. Tokyo imperial place is located 10-minite walk away from JR Tokyo station (Marunouchi central exit). The place is basically is closed in normal days, however there is a official guided tour. You can apply the tour online if you want. The online service of application can be accessed from 5:00 to 24:00 in Japanese time. This place is also known as the castle ruin of Edo-jo (江戸城). There is a moat around Kokyo. Akihabara is well known as Electric town. There are many consumer appliance stores around Akihabara. You can buy PC, peripherals and gadgets at a reasonable price. Akihabara is located in the central Tokyo (Chiyoda ward), so you can probably visit there at the same day of Tokyo imperial palace. You can consider to visit the following places as well (I've linked to the Wikitravel).